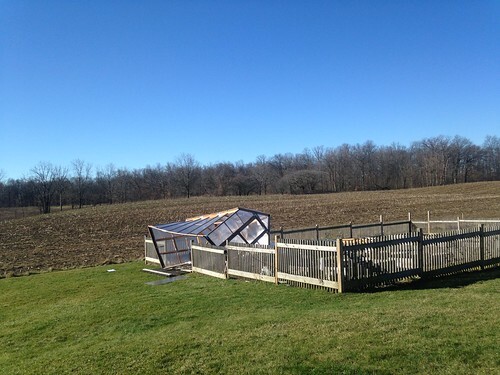 Nothing like some high winds to teach you about not taking shortcuts when you’re putting in a little greenhouse. 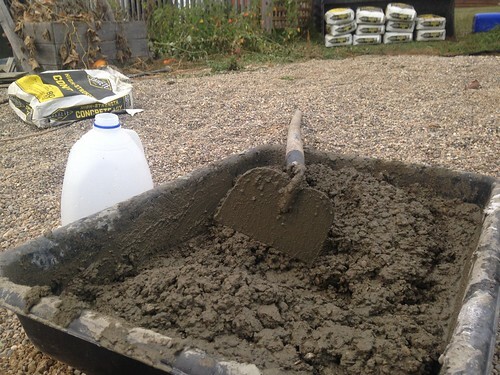 I first built this thing (from a kit) last June, and while I leveled out the foundation with some bricks and gravel and used the provided anchoring system, which was a couple of X-brackets with some rebar driven into the ground. I’m going to be honest and tell you that deep down I did not think this was a good enough foundation for some of the high winds I get out here in the country, but I was far too excited about building the greenhouse (and checking it off the list) than, you know, potentially needing to dig a bunch of holes and haul a lot of concrete into the garden for a proper foundation. So I didn’t. 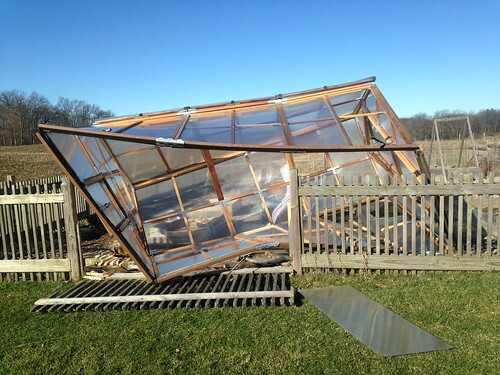 And then my greenhouse blew over. Let this be a lesson to all of us, but mostly to me. I know better. 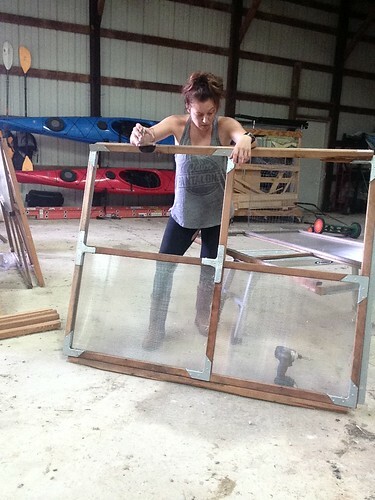 And my penance for knowing better but taking a shortcut is that I’ve spent the last five months looking at the broken pieces of my once adorable greenhouse stacked up in my barn all summer. The good news is that I’ve had five months to think on my mistake and figure out how to do it better. And by “do it better” I mean, “figure out how much concrete I can legitimately anchor this thing to the earth with.” A thousand pounds? A thousand pounds sounds about right. If it isn’t clear by that super awesome picture (my napkin drawings are getting better… sketchup, what??) 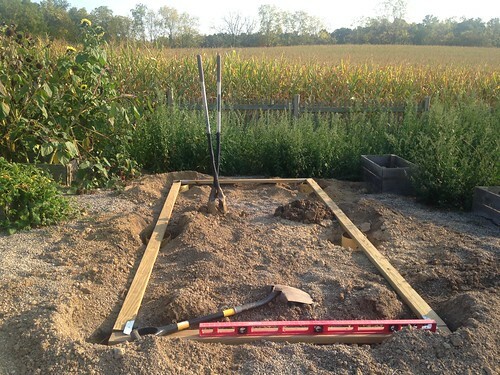 the new foundation for the greenhouse consists of sinking 6 concrete piers into the ground (8″ wide, 4′ deep) and then attaching the greenhouse with some 8″ anchor bolts. 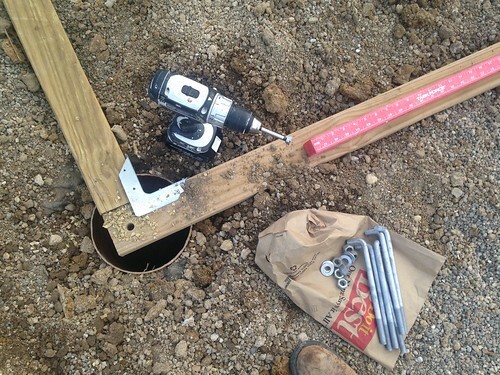 So, the first step was digging the holes…. I love having that auger on my tractor, but I still end up doing a hell of a lot of hand digging. 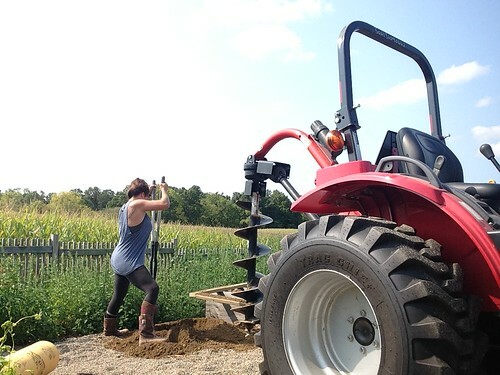 One day I’ll have a project around here that doesn’t require me to use a post-hole digger, but this was not that day. This is a small structure (6×12) so I just used a 12′ board and a 4′ level to keep everything straight. 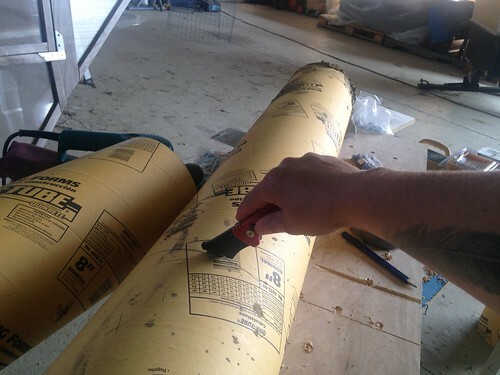 Once the sonotubes were level and set, it was time for anchor bolts and concrete. Building the sill plate first is a little backwards, but since the greenhouse panels are pre-built I needed to make sure everything would fit to that size. 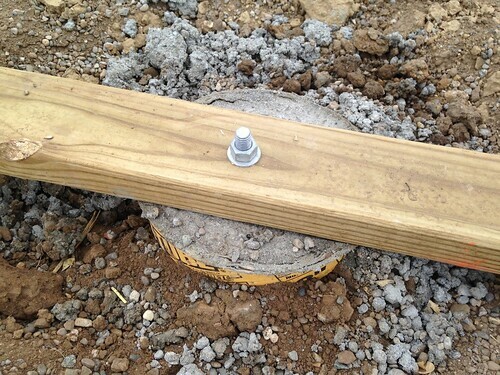 Typically I’d use a scrap board to hold the anchor-bolts in place while the concrete dries, but in this case it was just as easy to use the existing sill plate boards. 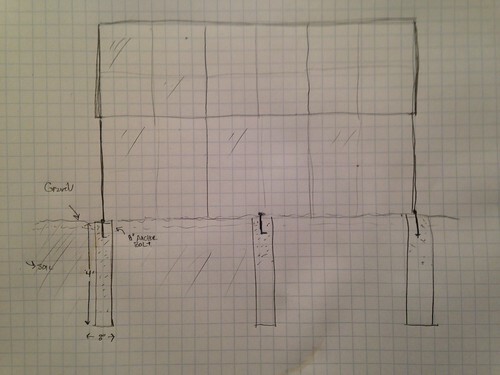 So I drilled a 5’8″ hole where I wanted the bolts (one in each of the 6 piers), then put the bolts through the boards. Then came the backbreaking work of hauling twelve 80# bags of concrete over and mixing them one at a time. In retrospect, this would have gone a lot quicker as a two-man job (one mixing, one shoveling into the forms) but it was Sunday night, and I am just one woman, so a one-woman job it was. 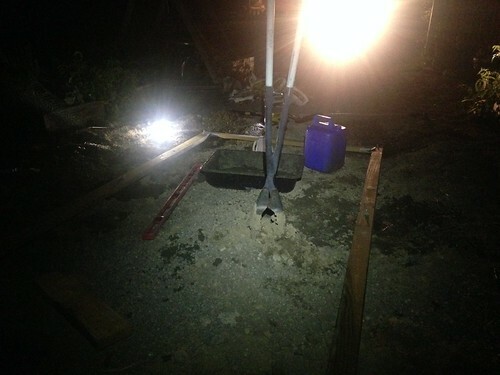 Which I did, by the light of the tractor and every flashlight and headlamp I own. And here’s how the anchor-bolts look, fully set. Next up will be using some of the old pavers I have in the barn to fill in the gaps where the ground level is below the piers, and then I’ll backfill everything with more gravel. And then it will be time to put everything together again. Way to go, Kit! Heck no on hauling 80 lb bags of cement! Hope you used the tractor! Good thing you’ve been working out, lifting all that concrete! Lovely greenhouse. The link was broken but in one of your pictures it showed the name. Thanks for sharing with us. Hey Tracy – What link did you try to click on that was broken? 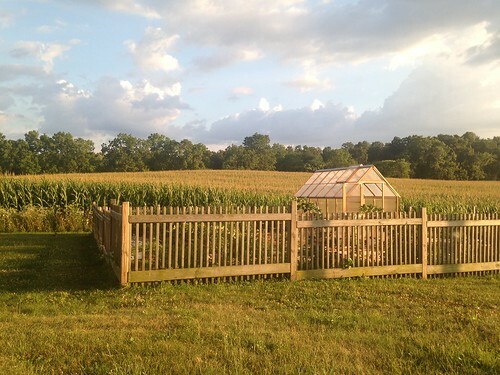 You are going to be so proud of yourself with your beautiful, well-anchored greenhouse. 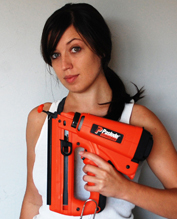 It looks like it is going to be super sturdy. Wow that looks like a complicated project. 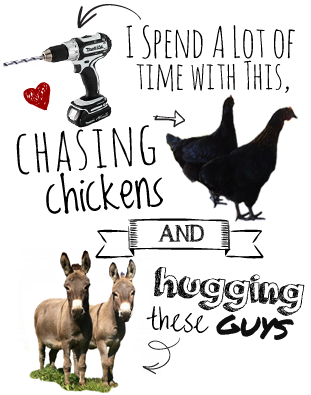 But the results are more than awesome! Kit this is great! It is such a lovely article and I find that the photos are lovely as well. 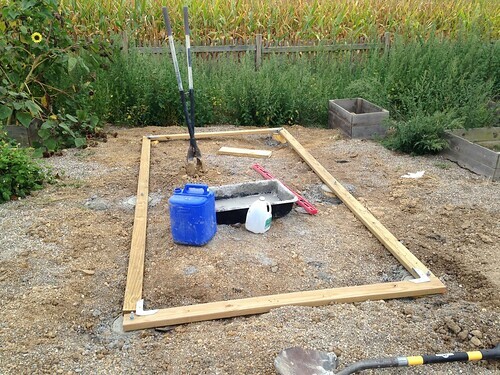 It’s just amazing how you put all these together on “Rebuilding the Greenhouse: Foundations” with such great tips! Looking forward to more of these.